FUNERAL The funeral of Robert Wright took place on Wednesday 11th April at 11am. We express our condolences to Robert’s wife Audrey and family. BAPTISM On 23rd April, Holly baby daughter of Stephen Gallagher and Debbie Marshall was baptised. Please pray for Holly and her family as she begins her Christian life. WEDDING On 6th April the wedding took place of Dr. Emmanuel Okoro and Mary Ann Ezieinma. We wish the newly weds every future happiness. 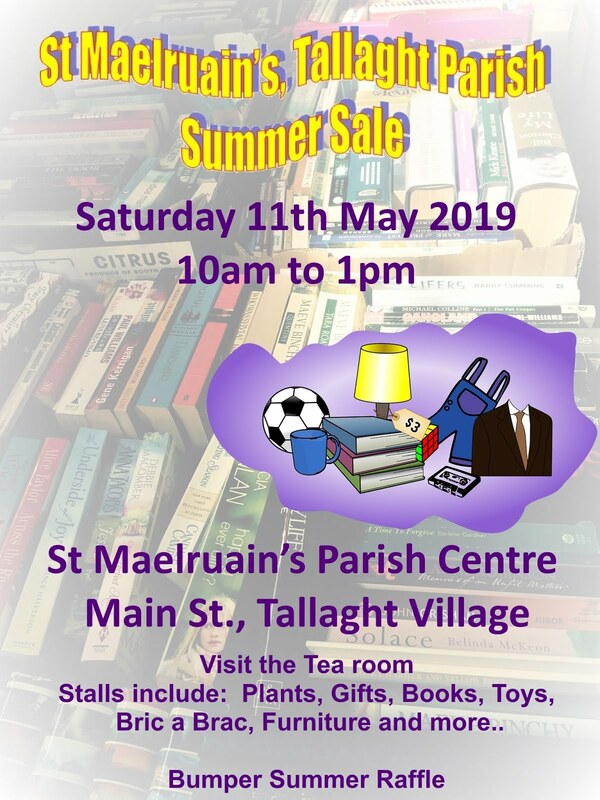 THE SUMMER SALE The date for the Summer Sale had been set for Sat 25th May at 10am Please do what you can to make this event a success, donate items for the stalls, buy, sell raffle tickets, volunteer to help out. Contact Ronnie Scott, sale co-ordinator 086 804 5090. PEASE COME ON THE DAY AND GIVE THIS FUNDRAISING EVENT YOUR SUPPORT! EASTER VESTRY The Easter Vestry (AGM) took place on Sunday 14th April at 11.30pm following a shortened 11am Morning Prayer Service. The following is a list of those elected to sit on the Select Vestry on your behalf. Welcome to those who are new to the Vestry and thank you for all your hard work to those who have retired from last year’s Vestry. Vestry: Jim Bird; Percy Griffin; Laura Fryday; Heather Kennedy; Brian Good; Catherine Whittle; Olu Segun Kuti; David Harley; Gillian Wells; David Hutchinson Edgar; Derek Sargent; Mandy Donaldson. BIBLE STUDY GROUP The Bible Study group have moved their meeting time from Wednesday evenings to Wednesday mornings at 11am. On the first Wednesday of the month the bible study will follow the Holy Communion Service. (Unfortunately there will be no Bible Study on 15th May). WHIST DRIVE The next Whist Drive will take place on Mon 20th at 8.00pm in the Small Hall, all welcome! CONFIRMATION Confirmation took place in Zion Parish Church on 21st April at 3.30pm. Please pray for Emma Cannon, Andrew Cloughley and Prince Nwakor were confirmed from Tallaght. MOTHER’S UNION On Monday 8th April we had our AGM and Bring & Buy. Valerie thanked everyone who attended throughout the year – our programme for the year was enjoyed by all who attended. All suggestions for next season have been noted and will be considered at our committee meeting in July. Our outing on Saturday 18th May Lismore Castle and Gardens is getting closer! There are still seats available should you have any extra friends who would like to come along. . 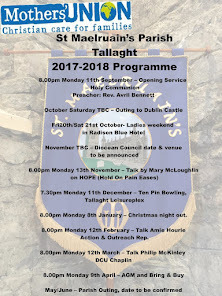 The cost per person will €61 (which will include morning tea and scones, entry to the castle and gardens and a four course meal on the way home. Everybody welcome to join us! 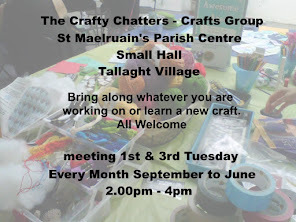 Full details available from Valerie 086 8594850 or Miriam 087 2939751. On 16th April Whitechurch Branch held an area meeting, which Noelle, Valerie and Miriam attended. At Council Meeting on 23rd April, there was particular emphasis on how very grateful the maternity hospitals are for our knitting for premature and stillborn babies. There are new patterns in the latest copies of Links. I know all parish knitters are busy knitting for the Flower Festival but keep it in mind. TABLE TENNIS We have closed up for another season and hope everybody has an enjoyable summer. Our numbers have been low for the last few months, so we hope we can encourage more players to join us next season. 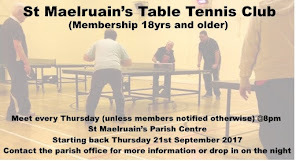 Our club is a very relaxed one, and players of all standards are welcome to come along on Thursdays. We closed with our A.G.M which was well attended by our members and there was plenty of discussion and suggestions. We were all sorry to hear that Andrew Seymour, who was Secretary for about six years decided to stand down this year. Andrew has always been a loyal member and has been there every Thursday to help open up and keep us all on our toes. A presentation was made to Andrew at the meeting and although he is stepping down as Secretary, we're all delighted to hear he will continue to play. Regina Donoghue agreed to take over the role of Hon. Secretary for the coming year. Vivienne Bright continues as Hon. Treasurer. Committee members are Bobby Wilson and Hilary Cleary. We plan to re open on September 19th at 8.00pm. Happy holidays all! Anchor Boy Cup: Oscar McDermot. Laughlin Trophy: Callum O'Dwyer. Whitten Cup: Johnathan Parkhill. Junior Bible shield: Callum O' Dwyer. Squad Cup: Lionel Deverell. Captains Shield: Oisin McMullin. Recruits Cup: Jay Nwanze. Bible Shield: Lionel Deverell. Laughlin Millenium Shield:Callum and Kyle O'Dwyer. In addition, nine boys received attendance awards: Aaron, Johnathan, Callum, Kyle, Daniel, Sam, Oscar, Darragh and Ruben. The company also won the batallion drama competition for junior section boys this year. Well done boys. Well done too, to the "special" Girl's Brigade team under the guidance of Ruth McAuley for their excellent display, complete with teddy bears! GIRL’S BRIGADE The Girl’s Brigade display took place in the Parish Centre on Saturday 27th April. It was a bitter sweet occasion as we were sorry to say goodbye to Captain Carol Fox who has stepped down after 40 years of loyal service to St. Maelruain’s Girl’s Brigade company. We were delighted to be able to make a presentation to Carol of an engraved piece of crystal along with a cheque. Carol has left the Company in the safe hands of Fiona Monaghan who has taken over the office of Captain. 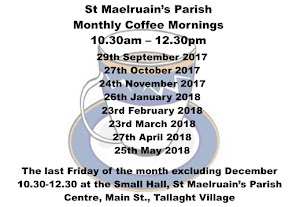 PARISH COFFEE MORNING The next parish coffee morning is on Friday the 31st May, 10am - 12noon, in the Old Hall. Hope to see you all then. How the time has flown since we returned after Easter. The third term is always busy and this year is no exception . The school had a basketball team represented at the Garda Blitz for primary schools in Tallaght on April 15th , they played well and enjoyed the experience. Our football team had an afternoon of football at St. Aidan’s Senior School playing a series of matches. Sports Day will be held on either Friday June the 14th or June 21st depending on the weather. Ms Rountree’s Trip to Dublin Zoo was cancelled on April 25th due to bad weather and it is being rescheduled. This class will also be going to Corkagh Park on Friday the 31st of May and to Tayto Park on June 20th . Ms Morrow’s Class had a busy second week of term . On Tuesday the 16th they went to Tallaght Library and on Friday the 19th they went to Collins Barracks to attend a workshop on creative writing .This class will be going a trip to Funtasia in Co Meath with 3rd and 4th Class on Thursday June 13th . The Junior Infants will be going to Newgrange on Tuesday May 28th and to Corkagh Park on Friday June 7th. There will be a Drug Awareness Programme for the senior boys and girls starting on and it will run for 6 weeks . It will be presented by two staff from the Tallaght Drugs Task Force. We have only 6 pupils graduating from 6th this year. We will be saying goodbye to them on Wednesday June 26th. UPCOMING EVENTS: Firhouse May Festival, Sunday 19th May in the Carmelite Convent, Firhouse Rd 2pm – 6pm.